Osaka (VNA) – The real estate market in Vietnam is the most attractive in Southeast Asia, according to Director of Japan’s Global Link Cooperative Yoshinori Nakata. In an interview with correspondents from the Vietnam News Agency on the sidelines of the TMS Group’s investment promotion workshop in Osaka on April 9, Nakata said that it is not just Vietnam’s real estate market, but those in some Asian countries like Cambodia, Indonesia also have good prospects. However, he believed that Vietnam is the most attractive due to its safe and stable investment environment. According to Nakata, the real estate industry in Vietnam has been developing to become the number one investment channel. Kako Sasai, head of the business information division of the Japan External Trade Organisation (JETRO), said foreign investment in Vietnam’s real estate could increase in the time ahead. She noted that Japan’s investment in Vietnam went up rapidly from 2016 to 2018. The number of Japanese firms investing in the Southeast Asian country has surged, resulting in the increasing demand for offices and houses. Most Japanese investors in Vietnam evaluated that the country has lots of potential and brings stable profits, she said. The Vietnamese Government and enterprises have been focusing on attracting more overseas firms to invest in Vietnam beyond the field of real estate, she added. According to the latest survey of JETRO, Japan’s direct investment in Vietnam has increased in terms of the number of businesses and the amount of capital. As many as 70 percent of Japanese businesses plan to expand operations in Vietnam, while 88 percent expect their revenues in the market will increase in the future. Toru Tomita, director general at the Osaka-based O.M.NET cooperative business association, described Vietnam as a young nation with abundant labour supplies. In the future, more Japanese businesses will come to invest in Vietnam, he said. The investment promotion workshop in Osaka is part of activities of the TMS Group to introduce the investment environment in Vietnam and seek potential partners in real estate projects that the group is implementing in Vietnam. Vietnamese Consul General in Osaka Vu Tuan Hai affirmed that the Vietnamese Government will create an open and equal business environment for Japanese investors. 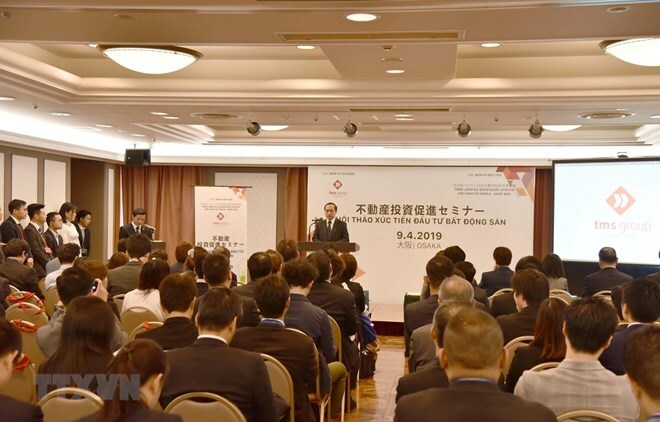 The Vietnamese Consulate General will continue supporting and accompanying Japanese businesses in studying, preparing and implementing business investment plans in Vietnam, he said.